Nakusp mayor Karen Hamling greets paddlers coming with a CRT message. A group of paddlers traveling from the ocean to the headwaters of the Columbia River in Canal Flats pulled ashore in Nakusp recently. A group of paddlers traveling from the ocean to the headwaters of the Columbia River in Canal Flats pulled ashore in Nakusp recently. At first there was a black speck on the grey water reflecting the cloudy sky, but as they came closer, four paddlers took shape in their canoe. Guides Adam Wiks-Arshack, Xander Demetrios, John Malik Zinser and fisher Jay Callahan have been making their way up river since August 1. But all this paddling isn’t just to get some arm exercise: all four young men are passionate about fish and wildlife, and are hoping their trip raises awareness of the plight of salmon who used to navigate the waters of the upper Columbia long before there was a border or dams. On their way north, the three river guides stopped at five different schools to make dugout canoes along the way as part of the Voyages of Rediscovery, a program designed to facilitate educational expeditions. 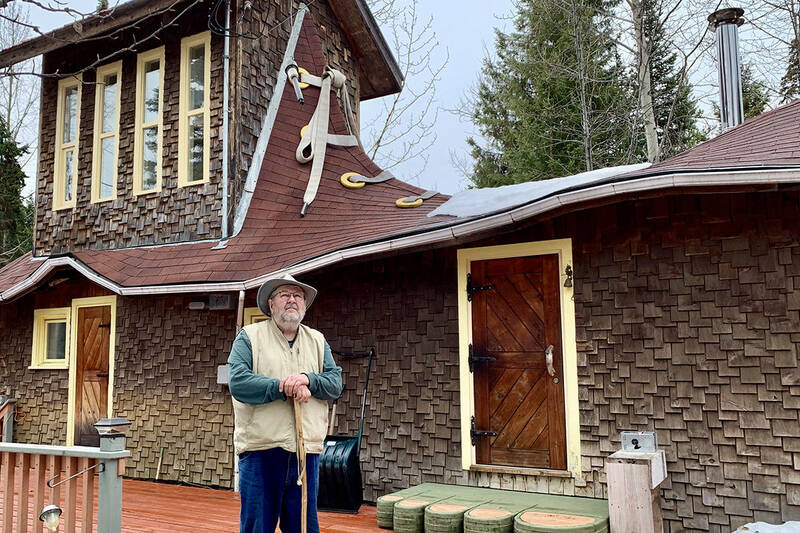 They have been making Voyages for the past five years, including trips along Lake Roosevelt, and a Canadian excursion into Ontario last year making birch bark canoes. This time out on the water, they are bringing a message that it’s not too late for people to get involved in the Columbia River Treaty (CRT) negotiations to ensure that environmental issues are part of the talks this time. Canadians are key to the treaty, Wiks-Arshack said. “Canadians have the power,” said the expedition leader, pointing out that Canada has flood control and holds the key to the Columbia’s flow. He hopes Canadians will put pressure on the Americans to ensure environmental considerations are part of a new treaty, unlike the one negotiated back when the dams were constructed. Wherever the group has gone, they have asked people living along the Columbia what is at stake, what is being changed and what’s happening in regards to the CRT locally. For their part, the voyagers would like to see that fish and fish passages are on the table in the next round of negotiations, whenever that takes place, and are hoping to inspire others along the river to stand up for fish as well. They have been able to recruit help along the way directly. Jay Callahan joined the group when they literally crashed into the beach where he was fishing. Passing through one of the locks along the dammed river, the canoe had had to join a larger boat to go through. When they were through and loose of the barge, they had been flung toward the banks of the river, flying through Callahan’s fishing lines and onto land. The fisher, who had recently returned from a huge tribal paddle of over 15,000 people along the Columbia, took it as a sign that his canoe time wasn’t done and joined the expedition. The original trio of river guides had met with good fortune early in their trip up from the Pacific, and had been able to sail hundreds of miles, saving their arms for the challenging rapids near Castlegar. Their first day into Canada they encountered snow for the first time during their trip, an unfortunate cliché, and may encounter more before they are done. After two months on the water, they plan to reach Canal Flats at the end of October and their paddling time will be finished, but their campaign to raise consciousness of the importance of bringing environmental considerations to the treaty table will still be going strong.